Tim Frauenfelder is living many a child’s dream – studying palaeontology, volunteering at digs and spending most of his days talking about dinosaurs. So what is it that has so captivated Tim and taken him to Lightning Ridge, Canada and Argentina to study fossils? Tim’s special interest is sauropods and in particular the large species that lived on an ancient floodplain at Lightning Ridge, in western NSW. 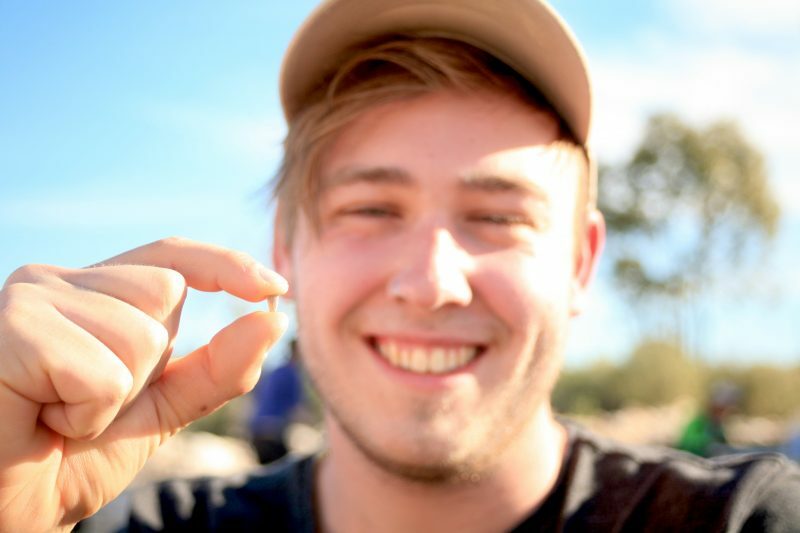 It’s a fascination that dates back to one hot, dusty day in 2014 on the very first day of his first dig in the western NSW outpost, when he found a single sauropod tooth as he sifted through mining tailings. Tim finished his Bachelor of Science (Palaeontology) degree at the University of New England (UNE) at the beginning of 2017 and is now back to do Honours, having amassed some jaw-dropping practical experience. As a volunteer within the UNE Paleoscience Research Centre, the 24-year-old has participated in three Lightning Ridge dinosaur and fossil digs organised by the Australian Opal Centre and Australian Geographic, learning valuable fossil collection, identification and curation skills. In 2016, two months after completing an online palaeo course (DINO 101) at the University of Alberta, he was on a plane to Canada to further his field experience with that university’s dinosaur research group. An invitation to complete an advanced paleontology field course followed, then six weeks at Dinosaur Provincial Park excavating four sites and a month in the university’s lab learning how to prepare fossils. During his undergraduate degree, Tim helped his supervisor and mentor, world-renowned dinosoaur hunter Dr Phil Bell, to mould and cast, CT scan and 3D print about 10 bones from a new dinosaur Phil identified from Lightning Ridge. When Tim finished, he spent seven months working as a tour guide at the Australian Age of Dinosaurs Museum in Winton, leading groups around some of the best-known fossil sites in Australia. IMAGE: Tim Frauenfelder with a plesiosaur (marine reptile) tooth he found at Lightning Ridge.